In Blended, Isabella, or Izzie (as her mom calls her), is a sixth grade girl whose mom is white and dad is black. She isn’t sure about her identity, but is leaning more towards black since her skin isn’t white and her hair isn’t blonde like her mom’s. Not only is she a “blend” of colors/races, but her parents are divorced and each have a new family, so she is part of a blended family. Isabella is put in the middle of her parents’ custody disagreement when they start to fight in front of her, and Isabella can’t take it anymore. To top it all off, someone at school has played a racist prank on one of her best friends, and Isabella is sick of fending off comments about her identity as a mixed race girl. A major event causes her family members to look deeper at their relationship with Isabella and with each other. What I liked about this book was that it addresses the issue of being mixed race in today’s climate, which you don’t see much in literature these days, especially children’s literature. It also addresses the bitterness that can come from divorce, and putting children in the middle of it. I can already think of at least 3 students in my class who will be able to relate to that aspect of the story, although really, it’s the parents who need to read this book. What I didn’t like about this book was that the issue of rude comments wasn’t really addressed with one of Isabella’s friends. I am white, but my children are mixed race, and I am not sure if they will have to address these questions. I’m not sure they’d be offended by them, but that is my white privilege, not knowing and not fully understanding that perspective. I’m on a “books about people with disabilities and/or teach kids to be tolerant and kind and aware” kick. There was Because of Mr. Terupt, Rules, and a few others. 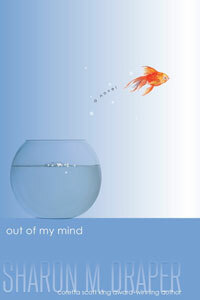 Out of My Mind gives a different perspective, that of the person WITH the disability. We normally see from another person’s perspective how people treat a person with a disability, whether it is a physical, academic, behavioral, or something like autism. This story is written solely from the perspective of someone with a lot to offer but without the ability to offer it. Melody is a fifth grader with cerebral palsy. She is in a wheelchair and cannot talk, so she has been overlooked all of her life. Her class is (from my experience as a special education teacher) a moderate to severe special day class, and she has had a series of terrible teachers who did not last. She finally gets a good teacher who recognizes her potential, gets her a 1:1 aide, and mainstreams her into the general education program. Melody’s potential is soon recognized (and doubted) when she wins a spot on the quiz team at her school. I won’t give away the story, but there are a few horrible things that happen, things that would make you want to make phone calls and write angry emails and hire a lawyer if they were to happen to you. Other things are accidents. Regardless of the situation, Melody is a strong, determined, brilliant young girl who handles most situations with grace and a maturity beyond her years. What I liked about this book was the change in Melody. She started out telling her story to us, but she couldn’t really tell her story. She almost seemed depressed, not being able to communicate or get what she wanted. She was misunderstood, too. Her mother thought she killed her own goldfish, and her father didn’t understand that she wanted a burger and a shake. Her classmates and teachers didn’t realize that she was NOT mentally retarded, but quite the opposite. I really liked how she was able to prove them wrong and get control of her life. What I didn’t like about this book was it didn’t really feel like Melody got justice. I wanted to see her classmates learn their lesson through a crushing fall, an injury, a major burn to their ego. That didn’t happen. I wanted the man in the ugly brown suit to get fired or written up or quit due to public shaming, but he did not. I guess that is reality, though. The lesson might be learned later, or it may never be learned at all. It left me with a frustrated feeling, but as I mentioned before, sometimes frustrating endings make it a good book, because it draws out your emotion and causes a reaction.